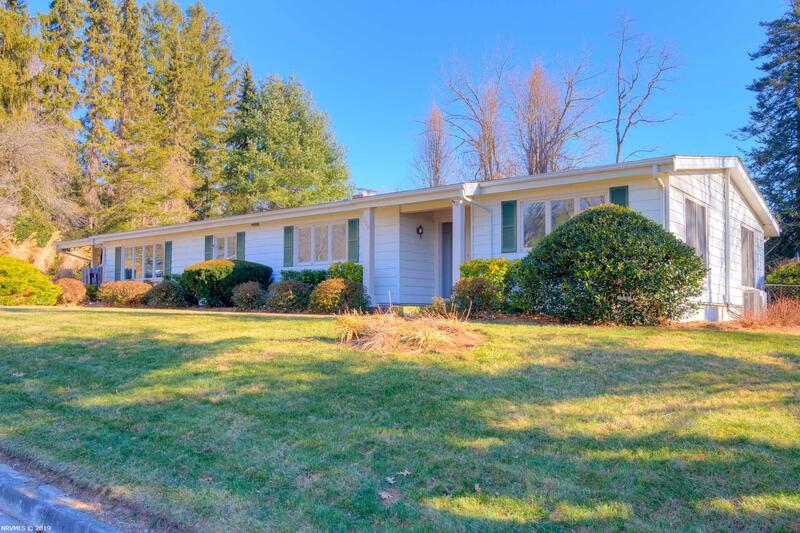 Well-maintained 3BR/3BA mid-century ranch on over a 1/2 acre lot in downtown Blacksburg. With 2200+ sq. ft. of main level living space, this home offers vaulted ceilings throughout and a split bedroom floor plan with hardwood floors in living room, dining room, owner&apos;s suite and additional bedrooms. Open living/dining room area with gas log fireplace, built-in shelving, floor-to-ceiling windows and access to back patio through the beautiful French doors. Nice galley kitchen leads to breakfast area and family room, also complete with floor-to-ceiling windows, vaulted ceiling and built-in shelves. Owner&apos;s suite offers arched ceiling, walk-in closet, full bath and an adjacent office with built-ins and French doors leading to the patio. This beautiful home rests on over a 1/2 acre park-like setting with numerous gardens, mulch beds, storage shed and much more. Don&apos;t miss this wonderful opportunity to live in downtown Blacksburg! Directions: S Main To East On Hemlock. Home On Right.